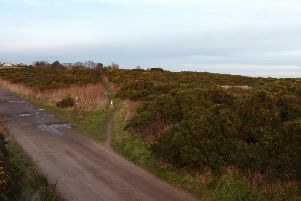 The Mains of Cowie site (right) overlooks the caravan park on its east side. Stewart Milne Homes have confirmed that they intend to submit a renewed bid to build housing on a site at Mains of Cowie on the outskirts of Stonehaven. A previous bid by the company to build 400 homes, as well as community and retail facilities, a primary school, and a petrol filling station was rejected by the Kincardine and Mearns Area Committee earlier this year amid concerns about flooding and the visual impact it would have on the area. Ex-vice chair of the SDCC, Allan Sutherland, who strongly opposed the original plans, commented: “Despite consternation regarding their Mains of Cowie stance the Community Council has earned a lot of goodwill lately with their initiative to locate defibrillators around the town. The cost to Aberdeenshire Council to defeat this application will be equivalent to many such devices, which would be a pity as there may be a few cardiac arrests locally if this goes ahead.”. Phil Mills-Bishop, who is a member of the Stonehaven and District Community Council (SDCC), told the Leader that he and SDCC chairperson Knud Christensen had held a meeting with a representative from the company, however he said that, unless changes were made to the application, the community council would be “unlikely to support it”.